Now, onscreen and off you both have become a little bit more visible since the first season. Laverne Cox: Little bit? You think? What’s been the most exciting part of that success, and what has been the most challenging? 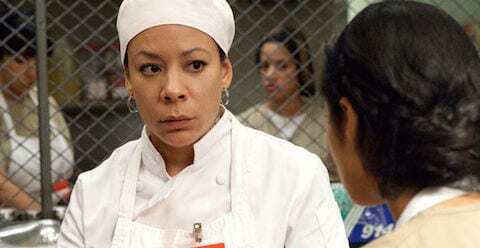 Selenis Leyva: For me, it’s been pretty awesome! I’ve done a lot of TV and other work, and I thought before this when I did my episode on Girls, I got a lot of attention … But with Orange it’s been on another level of insanity. I’m very grateful. I get excited for people who come to me and they’re excited, because I’m like, ‘Wow! You’re so happy to see me! This is good, this is making my day!’ I think my daughter is a little bit freaked out by it. We went to the movies yesterday and a bunch of teenage girls came to us, and she got freaked out by that. SL: And I said, ‘I know sweetheart, it’s scary, but Mama’s life has changed.’ It’s wonderful we have a platform now. We also have a responsibility that comes with success and celebrity. I have to be careful what I say and what I do, not only because I have a child who’s 11 years old who's always looking at me, but because now I have hundreds of thousands of people watching. LC: You’ve got millions, girl. SL: Millions! And as an Afro-Latina actress, I feel even more responsibility because I’m in this show that’s entertaining, but at the same time, it’s starting all these wonderful conversations about different types of people and different situations, so it’s lovely. And bring it, I’m ready for more! What movie did you guys go see? LC: I wanted to ask her too! SL: The Fault in Our Stars! LC: I met John Green who wrote the book, he’s amazing. What did you think of the film? LC: Did they stop you in the bathroom, girl? LC: It’s sweet, but it's like … I guess for me, it's hard for me. I don’t often think, ‘Okay, I have to be ready to receive love right now,’ every time I leave the house. SL: I like it that people are nicer to me! I’m taking advantage of that. People are nice! They’re sending me free stuff, drinks! LC: The love is great. I guess it’s just about boundaries for me. When I go to events and stuff, it becomes work and not wanting to disappoint people, because people have projected all sorts of things onto me and I don’t want to disappoint them. And that’s what I’m hyper aware of, of not wanting to disappoint them, but also wanting to just be a human being. There’s a moment in Beyoncé’s I Am…Sasha Fierce tour at the very end – I know, right? Beyoncé, it always goes back to Beyoncé! – but it said ‘I Am’ for the most the concert, and then at the very end it said, ‘I Am Yours.’ And I was like, ‘Yes, we are yours, Beyoncé! Yes, you belong to us!’ And then I was like, that’s lovely as a fan, but I don’t want to live that way where I belong to the fans, because that’s a huge responsibility. I guess I’m feeling the responsibility piece too in a really intense way, and it’s really heavy. It’s been really important to me to find spaces to laugh and to be irreverent and not take on all that responsibility. And there’s so many amazing trans folks out there doing amazing work. They need to get attention too. You both talked about how you sort of feel like you’re advocates now because of the prominent roles you have. Do you ever find it difficult to balance that with the fact that you just want to be an actor? How do you keep that balance? SL: I think for you it’s fallen more in that realm, because a lot of people are looking to you to be the mouthpiece? Did someone tell you you were a mouthpiece? LC: But I chose to speak out. Let’s keep it real, I chose to speak out, and I continue to choose to speak out about things that are important to me and where I see injustice. So, I’ve chosen that, but I’m an actor and I’m an artist first, so I have to make decisions first based on that, so there are certain issues that I can’t talk about. Controversies out there that I have to leave to other people because I’m an artist. I have to be very deliberate about everything. SL: We have opinions about everything, but we can’t start getting on the soapbox just yet, because we would lose the whole actor thing and turn into something else. LC: For me it’s about choosing very carefully which battle I’m going to go for. But it’s been great, getting to do a documentary about CeCe McDonald, and when I was on the Katie Couric show the last time I was like, ‘We’re doing a whole segment about CeCe McDonald, a black trans woman who spent 19 months in a 41-month prison sentence in a men’s prison for defending herself.' And we did a whole segment on Katie Couric on network television about that. LC: Daytime! And we talked about Jane Doe, a sixteen-year-old girl who is incarcerated in Connecticut. She’s not been charged with a crime, and she’s in solitary confinement since April. Not charged with a crime! It’s insane! That’s insane to me! I got to talk about that on national television, and that makes me happy. I’d really be happy if we could get this girl out of prison, so hopefully more people will know about that and we’ll get some justice for people. We got to see a bit more of Sophia’s son this season, and it was such an uplifting, happy scene when you guys were playing cards. It was a beautiful scene. LC: It was so emotional! It’s funny, because I get so much direction of, ‘Don’t cry, don’t cry, don't cry!’ I think that was most of my direction for season one: Don’t cry. No, I’m kidding. But I was really emotional that day, and I remember I prepped, but I didn’t want to prep too much 'cause I just wanted to be in the moment with Michael and with Crystal. For me, those are the things that I dream of as an actor, getting to have these really complicated moments. It’s this moment of, okay, he’s finally here, how is this going to go? Is he going to come back? I want to hug him. SL: That’s the beauty of the writing! It goes nice and slow in real life pace. It didn’t end with oh, he hugged you, everything is back to normal. LC: We still don’t know what’s going to happen. It’s intense for me for the actor, but then it’s real, because how do you make this right? Do you make it right, in terms of repairing relationships with family? There’s an abandonment that’s happened because Sophia’s no longer his father, and there’s an abandonment that Sophia’s no longer there because she’s incarcerated. So there’s this stigma attached to that. I think parents have a need to connect and bond. I just think about my mom and it’s guttural. LC: But I have a mother. SL: And I believe every second of it. I think, again, the writing on this show is amazing. And then, you know, the acting is alright! The second season of Orange Is the New Black is available now on Netflix.